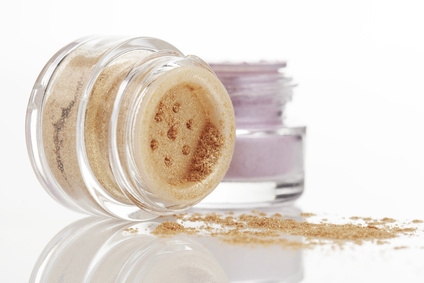 Did you know that you could use your mineral eye shadow to create your own uniquely beautiful new nail polish color? That's right, you can enjoy a new nail polish shade every time you take one off to put on another without having an endless supply of nail polish bottles strewn all over your bathroom. This simple tutorial will give you the ability to come up with all kinds of new nail colors to dazzle your friends with, and have shades that are custom to your needs instead of picking something from off the shelf. First: make sure your nails and nail beds are clean and tidy. Second: have a bottle of clear nail polish ready to go along with a paper towel. Third: choose your favorite mineral eye shadow or maybe two and mix them together for a unique shade. Don't forget to have an old plate handy for doing this in. Fourth: place your mineral eye shadow choice on the plate. Just enough for the process. Any unused portion, you'll want to throw out. Fifth: now take your brush dipped in clear nail polish and touch it straight up and down into the small pile of mineral eye shadow. Apply to a single nail smoothly and evenly. Only go in one direction and apply quickly without going over the same area, as this can cause the polish to begin to ball up. Sixth: after you apply to the nail, wipe the excess on the paper towel to keep your clear nail polish from taking on the color of your eye shadow. Seventh: for continuity in color, you'll want to freshly dip into your polish and then again into the mineral eye shadow pigment. Repeat steps 5 thru 7 for each nail until all 10 are done. Eighth: allow your nails to completely dry, no tacky feel and then follow up with a clear coat of polish to seal the color and to give the nails more shine. This will also protect the color you just applied from appearing dull. If you don't plan on using a multitude of colors then dipping your nail brush into the polish won't matter then if it takes on some of the residual, so you can skip the paper towel. However if you like to try a bunch of different mineral eye shadows with this method of personalized nail polish shades, then use the method above to prevent color exchange, or have more than one bottle of clear nail polish so you can eliminate the extra "paper towel" step. Finding your preferred shade among our many eye shadow colors has now added a new dimension to mineral makeup. Plus, what a great way to have fun with your teenage daughter or granddaughter. Your colors are only limited by your imagination. Yet another fantastic use for mineral eye shadows. They just get more and more versatile everyday.